It was a long, trying day. I was running late. I had no working cell phone or home Internet among a host of other things--and then I walked into Rivington House and a lady with HIV in a wheelchair shouted out to me with a broad smile as I got onto the elevator, "You look so pretty." She put a smile on my face and put everything back into perspective. Everywhere there were signs to be aware upon entering if you had a cold or an infection. This put everything in perspective too. To the residents at Rivington House with HIV/AIDS, getting the common cold can be a life and death matter. I made my way to the recreation room in the Penthouse where Rene was rehearsing with a nice-sized group of Peace of Heart choir singers with all groups pretty well-represented. There was a small audience already present as we warmed up. The acoustics in the room were absolutely lovely as Rene was quick to point out. And so the outreach with a small audience of fewer than 10 people began with a lovely rendition of Wanemo introduced by Enuma whose father had written the song, with a spirited duet by Gail and Leslie. Next up was "Downtown" with an introduction by Larry (for Pearl) as Pearl's roommate Christie Baugher was responsible for this arrangement and Pearl had suggested the song this season. "Downtown" felt light and free with lovely vocal support from Lenore and I think it was perhaps the first time we had performed it in an outreach so far this season. "Morning Song" was to follow introduced by Nancy with Rene providing fine support on haunting FIRST NATION (Canadian) flute. Next I introduced the sing-along Michael Row the Boat and invited the audience to sing along with the chorus part, "Michael, row the boat ashore, Hallejulah"! I saw several audience members, particularly a man sitting towards the back start to bob his head and mouth the words. Barry then delivered an intro to our homage to Charlie Chaplin, "Smile" and Peace of Heart Choir delivered a solid rendition. Next was "Paz y Libertad" introduced by Alejandra and Pokarekare Ana introduced by Evelyn. The sing-along "Rock-a My Soul" seemed to engage the small audience. One woman who sang along with me had the most colorful beads around her neck--some even resembled prayer beads, perhaps. I commented that I liked them. In response, she smiled and showed me her wedding ring and I was touched. "Mas Que Nada" introduced by Rob in a lovely dedication to his mother as it was her favorite song. I know she would have enjoyed our version as it was spicy with fine vocal support from Nancy and Alejandra. Ruth introduced "Let There Be a Peace on Earth, a nice way to end the concert and obviously appreciated by the same gentleman who liked "Michael, Row Your Boat Ashore." Siyahamba was to end the concert. We took a bow and exited the recreational room. What a great outreach it was! Fountain House is a supportive community center for people living with serious mental illnesses, like schizophrenia, bipolar disorder, and major depression. We warmed up and sang in the dining room, where they had urns of ice water with lemon waiting for us. This audience took a while to loosen up, but once they did, they were definitely involved. Songs they especially loved, judging by appreciative hoots as well as applause: Over The Rainbow / Wonderful World, This Land is Your Land, and Aquarius (with Wilfred doing the honors). During Give Us Hope, I saw a man listening with his eyes closed, as if he was absorbing the meaning of the song. When Rene said we were getting near the end of the concert, they said, “No! We want more,” so we did Rock-a-My-Soul, Peace Salaam Shalom, and Let There Be Peace. “Bravo!” they shouted when Rene signaled us to bow. Then they invited us to stay for refreshments. This concert was significant for POHC, because we premiered three songs: Over The Rainbow / Wonderful World, Chanukkah in Santa Monica, and Samiotisa. There were some bumps in Rainbow, but nothing major. This was very empowering. It has become a tradition for a member of POHC to do a post-concert write-up. 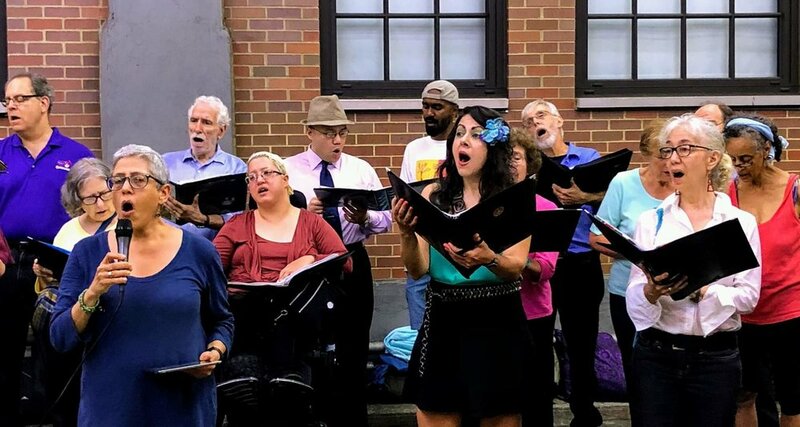 It started when our Sign-up Coordinator began emailing her summaries to the other members in order to entice newer members to sign-up to sing at community concerts held early in the season. It didn’t take long for Concert Write-ups to become greatly anticipated amongst our members, so we share them here in hopes that you’ll join us at a future concert. It was a sunny and brisk this past Saturday, as I was approaching the Park Avenue Armory Women's Mental Health Shelter for POHC's latest concert. I'm used traveling to the shelter now, since I've performed there before with POHC. I saw some fellow POHC members entering the building. After a short elevator ride we made it to the third floor where we set out coats and bags in the pantry. From there, I could overhear René leading the Choir in voice warm ups in the cafeteria across the hall, where we were also to perform our concert. Some of the shelter residents arrived in the cafeteria while rested our voices after the warm-ups. Soon, we were ready to perform. We started with Siyahamba, which we sang very well. The audience really liked it. Then we sang Peace Salaam Shalom. We tried to get the audience to participate they didn't know the words; I think they liked the song anyways. Our third song was Od Yavo. We did get the audience to clap along with this song. Then came Down By The Riverside and several choir members went down to the audience shaking hands when a catchy lyrics "I'm gonna shake hands around the world..." started. Next was Little Bitty Pretty One with yours truly singing solo along with my fellow Tenor, Alex. Then we did This Land was your Land. We usually have the audience singing with us, but the lyrics were not passed around, so the audience didn't sing it as much. They seemed to enjoy it regardless. We moved on to Imagine, then Hafinjan with Soprano Cheryl doing the solo. She has one great voice there. Toward the end we sang our Channukah song, Light One Candle, then a 9/11 commemorative song, Give Us Hope. We closed with our theme song, Let There Be Peace of Earth, with Soprano Deb and myself singing the solos. The audience loved us, and they thanked us for the performance we did for them, which was wonderful. On Friday, Peace of Heart congregated in an alcove of the lobby at Roosevelt Hospital on the West Side of Manhattan. 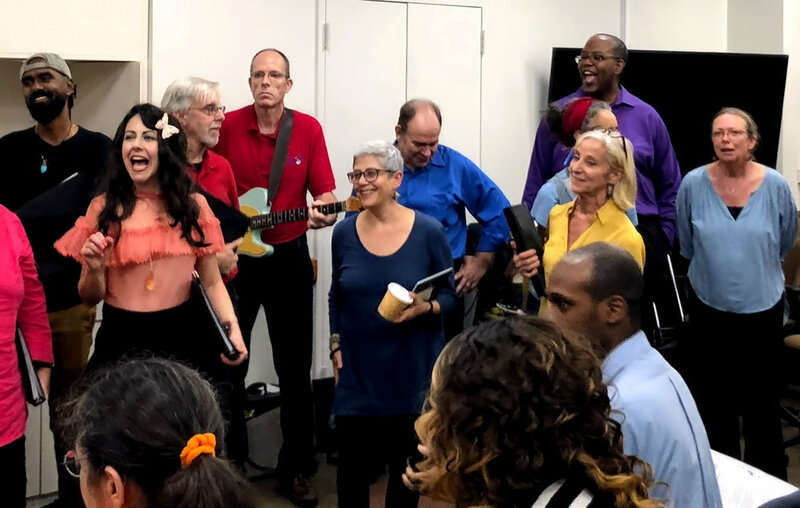 After the whole group arrived, we headed to the Volunteer Services office, where we warmed up before going to the Inpatient Psychiatric Unit to perform. With the help of the staff, we moved the very interesting piano (painted all over with flowers and supported by two paperback books, one under each front leg) to where we wanted it. Then Rene tested it by playing various classical snippets, to the amusement of the patients who were there early and watched the set-up procedure. The staff arranged chairs in rows, we arranged ourselves behind the piano, and the rest of the patients came in. We opened with Peace, Salaam, Shalom and followed with Higher and Higher, after which a woman called out, “Didn’t Jackie Wilson sing that?” (yes! ), and so a dialogue was started between the audience and the Choir that went beyond our introductions, all of which they listened to with interest. René’s bamboo flute introduction to the Cherokee Morning Song has been a hit with all our audiences so far, and this one was no exception. When we finished the piece, one of the patients asked what the words of the song meant. Rene told him: “I am of the great spirit.” (Another version of the translation is thought to mean "our hearts and spirits are strong.") The patient said that the main lyrics, “We n’ de ya ho,” sounded like “When they are whole.” He seemed pleased when we told him that was a wonderful observation. Guantanamera was another hit, with clapping and singing not only by the patients, but by the staff who were standing in the doorway. 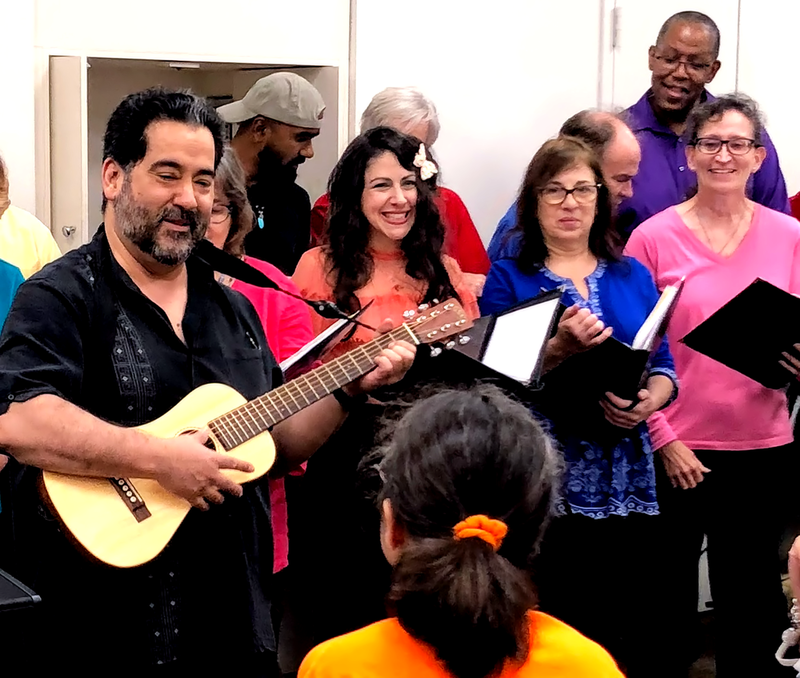 And when we finished the fade-out ending of Vela, someone said, “That’s gorgeous!” After, we closed with Let There Be Peace, we did the second sing-along, Down By the Riverside, and when that was over, we got a standing ovation from the patients! They were a wonderful audience, each listening in his or her own way, and we all came away feeling good about having sung there. - Peace of Heart Alto It has become a tradition for a member of POHC to do a post-concert write-up. 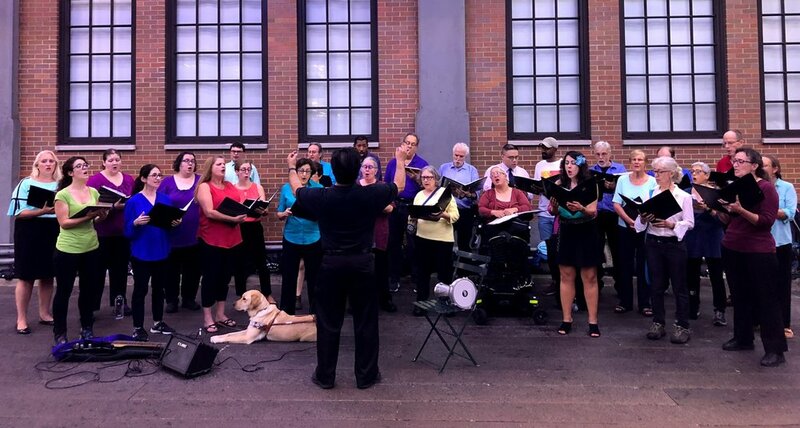 It started when our Sign-up Coordinator began emailing her summaries to the other members in order to entice newer members to sign-up to sing at community concerts held early in the season. It didn't take long for Concert Write-ups to become greatly anticipated amongst our members, so we share them here in hopes that you'll join us at a future concert. The fifth-floor wellness unit has been refurbished since the last time we were at Fountain House;, with artistic tube-lamps hanging from the ceiling. What remains the same is the airy feeling of the room with large north-east facing windows and the pots of fresh basil and parsley on the windowsill. We had an audience of about five for our warmups, and I saw some smiles when we got to "the-tip-of-the-tongue-the-teeth-the-lips." We finished the warmups by running through some songs, with René stopping us here and there to re-do a few measures. The audience seemed interested in these rehearsal proceedings. We began the concert proper with our rendition of Simon & Garfunkel's Bridge Over Troubled Water, and as we progressed from song to song, the audience grew. By the end of the concert, it numbered fourteen. Larry reached not only the audience, but the choir as well, when he read all the words of the POHC theme song, Let There Be Peace On Earth, as if it were a prayer. The room was hushed, and every eye was on him, including those of a man who had been facing the back of the room and reading a book. An uplifting, spiritual feeling pervaded the room. There was a brief silence after Larry finished, and then we began singing the words he had just spoken. It was a moment that could not have been rehearsed. After the concert, the audience members wanted to take pictures with us, so we posed with them. Soprano Angela Szpak put on her Miss Plus New York banner, and they flocked to take pictures with her, too. We all left with a good feeling. -Peace of Heart Alto It has become a tradition for a member of POHC to do a post-concert write-up. It started when our Sign-up Coordinator began emailing her summaries to the other members in order to entice newer members to sign-up to sing at community concerts held early in the season. It didn't take long for Concert Write-ups to become greatly anticipated amongst our members, so we share them here in hopes that you'll join us at a future concert.